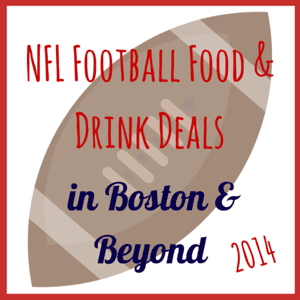 NFL Football Food and Drink Deals in Boston and Massachusetts! Are you looking for a place to watch Patriots games in Boston or other NFL football games without spending too much money on food and drinks? Here’s a list of all NFL food specials and drink deals in Boston, Massachusetts on Sunday and Monday nights! Pour House: Half price Dipper Menu from 4-10 PM on Sundays, and free stuff at Halftime of the 4pm game! Sidebar Boston: $7 bud and bud light pitchers and $2 bud and bud light pints. Half price apps from 12pm-5pm on the weekend. Don’t forget to check out Boston on Budget’s Cheap Eats list to find even more great food and drink promotions and specials.